Elder L. Tom Perry, of the Quorum of the Twelve Apostles, passed away on May 30, 2015, at the age of 92. He was such an inspiring man, and I have been reviewing and learning more about him. I love how Elder Perry was true to his testimony and his concern for other people right until his last day (source). “The family is the center of life and is the key to eternal happiness” (April 2015). “The most powerful teaching a child will ever receive will come from concerned and righteous fathers and mothers” (October 2014). “Obedience is a choice. It is a choice between our own limited knowledge and power and God’s unlimited wisdom and omnipotence” (April 2014). “Make the honoring of family traditions—holiday traditions, birthday traditions, Sunday traditions, dinnertime traditions—and the development of new ones a priority throughout your lives” (December 2012). L. Tom Perry, “Becoming Goodly Parents”. October 2012 General Conference. Marriage Matters FHE Lesson (May 2015). Biography and links to his recent conference addresses. My husband and I are celebrating 13 years of marriage today, and what better way to celebrate than a FHE lesson on marriage! 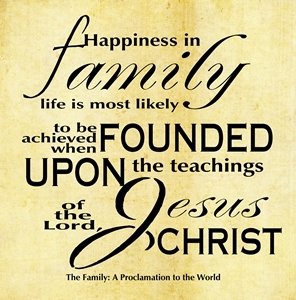 “Happiness in family life is most likely to be achieved when founded upon the teachings of the Lord Jesus Christ.” (The Family: A Proclamation to the World, paragraph seven). 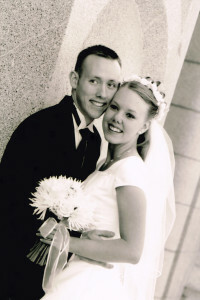 Use photo albums and scrapbooks to share pictures and stories from our wedding day thirteen years ago. Discuss ways that we can focus on and live the teachings of Jesus Christ in our family. Celebrate our family with a fancy cake for dessert made by dad! Discuss the following points from Elder L. Tom Perry, “Why Marriage and Family Matter-Everywhere in the World”. April 2015 General Conference. “Last November, Elder Perry attended a colloquium, which is an educational conference, at the Vatican in Rome, Italy, with Pres. Henry B. Eyring, First Counselor in the First Presidency, and Bishop Gérald Caussé. Explain how the location is honored by the Catholic religion and other Christians. The fact that leaders from our church would also be invited shows that many of our beliefs are honored by other religions too” (source). “As the world continues to watch us, let us be certain that our example will sustain and support the plan the Lord has designed for His children here in mortality. The greatest teaching of all must be done by righteous example. Our homes must be holy places in order to stand against the pressures of the world. Remember that the greatest of all the blessings of the Lord come through and are given to righteous families. 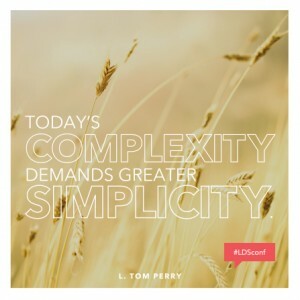 Elder L. Tom Perry, “Finding Lasting Peace and Building Eternal Families”. October 2014 General Conference. Elder L. Tom Perry, “Obedience through Our Faithfulness”. April 2014 General Conference. Elder L. Tom Perry, “Obedience to Law is Liberty”. April 2013 General Conference. “I believe family traditions are like the hewn oak trunks driven into the ground to build the Old Fort House. Make the honoring of family traditions—holiday traditions, birthday traditions, Sunday traditions, dinnertime traditions—and the development of new ones a priority throughout your lives. Honor them, write them down, and make certain you follow them. Studies show that the reason young people join gangs is for the tradition and ritual of belonging to something larger than self. That is what a family should be. Be certain you are creating a rich environment in which your family can look forward to special times of the year when traditions hold you together as a great eternal family unit. Elder L. Tom Perry “The Tradition of Light and Testimony”. The Ensign, December 2012, p. 29. “First, parents can pray in earnest, asking our Eternal Father to help them love, understand, and guide the children He has sent to them. “Elder Joseph Fielding Smith taught: “It is the duty of parents to teach their children these saving principles of the gospel of Jesus Christ, so that they will know why they are to be baptized and that they may be impressed in their hearts with a desire to continue to keep the commandments of God after they are baptized, that they may come back into his presence. Do you, my good brethren and sisters, want your families, your children; do you want to be sealed to your fathers and your mothers before you … ? If so, then you must begin by teaching at the cradle-side. You are to teach by example as well as precept” (in Conference Report, Oct. 1948, 153).